'Mann of Steel' – another box office bomb | Watts Up With That? WARNING: contents of this post may cause nausea, have your air sickness bag handy. The movie referred to is this one. Well, we all knew it was simply a matter of time before Mann took on the persona exhibited by his followers. In case you don’t know, SUNY’s Professor Scott Mandia is the guy running Mike Mann’s legal defense fund. My only question is, why does he need hip wader boots? He wears hip waders because, well, ‘it’ is getting deep…. Tell me that’s a photoshopped picture !!! No adult would dress like that in public. The truth behind Mann’s hockey stick! That Mandia “earnest face” pic looks like something off a scambaiter site. Yes, it’s definitely worse than we thought! Doth some one say that there be gods above? Led by the old false fable, thus deceive you. Is built-up from our good and evil luck. Same stuff requiring waders, different set of indulgences on sale. False prophets can still generate real profits, especially with some enabling rent-seeking legislation. And people believe that this delusional narcissist practices hard nosed, reality based factual empirical science? I would not trust him with the remote control for the TV. blackadderthe4th, Funny video, thanks for the laughs. So– Is it another episode of “mann of steal” ? Steel can also be spelled: s-t-e-a-l. Taxpayer research grants anyone? For a Mann of Steel he sure is reluctant to debate in public. More like Mann Mouse! If Mann didn’t exist, it would be necessary for the skeptics to create him. I, for one, would not have been a skeptic had I not encountered Micheal Mann. He’s the gift that just keeps giving. The mann is a legend in his own mind. You reminded me … I don’t think I have noticed an airsick bag for years. Maybe there is one in the setback pocket … but I rarely care to look too closely at what is in those. So Mandia once dressed up in a ridiculous costume for a Halloween party or similar. Good for a laugh I agree. And certainly the pretentiousness of the whole climate crusader thing with the hockley stick definitely deserved to be ridiculed. But having laughed at this picture a couple of times now, I’m really pretty much laughed out. Seeing the picture now just makes me uncomfortable. Mann is simply outstanding in his field…. or is it someone else’s field that he is squatting on? Any news on Mann’s various bits of litigation? Maybe dressing up as Manndrake the Magician might be more suitable. Since we see the magic trick illusion called the Hockey Stick. THAT is just … creepy weird. Having bent so many graphs into the required shapes, the man of steel is suffering from metal fatigue. Funny how none of these super heroes will stand up to debate anyone. They demonize people, then run, claiming “settled science” when the only thing that is settled is the fact they dont know or understand what drives weather and climate. I suspect they would soil their super hero outfits. It is stunning how well 2008Mann perfectly describes the behavior of 2013Mann. Is that a WEDDING ring on his fourth finger?! No way……. Well, you know how it goes. BS=Bull S—, MS=More S—, PhD=Piled High deeper. They really piled it on this time! AB — great memory! LOL, one erased people out of photos, the other erased data (and e mails). Funny how none of these super heroes will stand up to debate anyone. How can an adult dressed like this NOT be selling used cars or appliances? And please…..”Capt. Climate” instead of caped climate crusader. Steel (thanks to newer technologies and lower cost) was one of the driving forces behind the Industrial Revolution – which supposedly started the anthropogenic climate change mess. The irony is apparently lost on Mann. What a fool. Oh….I see what you mean about the ego! To those asking about the waders, I would have thought it clear that the waders were intended to represent jackboots. The heartbreak of dissociative identity disorder. The waders are for wading through an ‘imagined’ instant flood/sea level rise in a ‘single bound’. LAUGH — OUT — LOUD. WUWT has some fine minds. Much more witty than the stupid attempts at stand-up comedy that the Great Bore et. al. try. 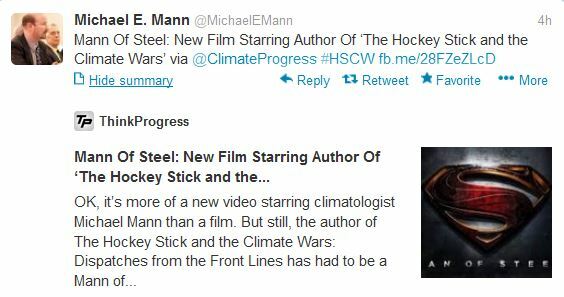 Anyone knowing human history knows that Mann’s hockey stick is complete nonsense. 2,000 years ago, Rome and China didn’t do the things they did because it was colder than today. We have had the evidence for this in actual excavations for years now, decades even, with leftovers from those people. Roughly a thousand years ago we see the same again, in Europe and Asia, again. The Danes planted wine (they don’t do so today, because it’s too cold up there) and Japan had an unprecedented cultural bloom . Cultures only bloom when the conditions are good, aka when it’s warm and you have time to sit down and write novels and paint stuff rather than huddling together and trying not to freeze to death. Interestingly enough we can only find such cultural bloom on the northern hemisphere. Cultures on the southern hemisphere never had anything even remotely similar. Any ideas on what the “C” stands for? I have my own theory but am willing to leave it to others. Humorously, the latest iteration of the genus Homo is once again at a half-precession (plus a few centuries change) old extreme interglacial. What is the latest hominid to do? 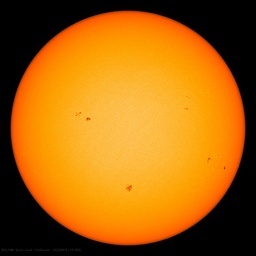 As we are at an eccentricity minimum at this end extreme interglacial (the next eccentricity maxima some 2 ice ages, and associated interglacials, away) what would you recommend? Species, or genus-level discourse, appreciated……..
God only knows, but, since he appears to be wearing the Soviet flag, “Communism” would be a good fit. Also the block-style font could be seen as two C’s: “Coyuz Covyetskik” (Soviet Union). Save by switching to Geiko? C stands for — “CONFUSED.”? C stands for — his grade average? Bwah, ha, ha, ha, ha, ha, haaaaaaaaaaa! He (apparently) talked one into marrying him!! There was a Soviet dictator who killed tens of millions. He called himself Man of Steel … Stalin. Mann is a profoundly dishonest person. Like his namesake. When I use the word “profound” I mean profound. When I use the word “dishonest” I mean liar. I see warmunism as one of the prevailing economic conditions – like, say, an abundance of an elderly demographic. One warmunist scientist probably costs as much as a hundred pensioners; first, his wage must be paid; that’s equivalent to 10 pensioners; second; the policies he helps to push through enable capital redistribution (subsidy theft) worth a multiple of that, so let’s just assume a factor of 10 again. In Germany, warmunist subsidies are about 20 bn EUR a year. Under my calculation we would therefore expect warmunist science to cause direct costs of 2 bn EUR a year. Given a German public R&D budget of 20 bn a year ( http://cordis.europa.eu/germany/rd-germany_en.html ) this sounds exactly right – the EU has vowed to spend 1/9th of its R&D money on climate-related activities. The guy has an ego so big you could fly a 747 through it sideways , and the irony is its that very ego that will bring his own downfall , upon which will be surprised to see who lines up to kick him on the way down . Such is the ‘quality’ of Mann. The comment ‘no adult would dress like that’ is surely making an unsubstantiated assumption. ….Humorously, the latest iteration of the genus Homo is once again at a half-precession (plus a few centuries change) old extreme interglacial…..
As we are at an eccentricity minimum at this end extreme interglacial (the next eccentricity maxima some 2 ice ages, and associated interglacials, away) what would you recommend?….. The thing that really sets humans apart is our ability to use energy that is not generated by our own bodies. With the use of abundant energy we can live in the Antarctic visit the bottom of the sea or explore space. Energy is critical to civilization and that is why the elite want to control and tax it. Looking at the Tweeter feed, nice to see the usual suspects paying homage to Mann especially the high priestess of biased reporting Goldenberg…….Overpec.Schmidt,Cook, and Heidi Culllen repeating the same B.S. Some of Manns comments seem to be close to libelous?? We all know “global T” hasn’t risen in 17 years, 5 months (23 years by satellite measurements); that polar bears aren’t stranded (they’re expanding in numbers to the point of being a nuisance); and the seas aren’t rising any faster than normal (so saying he leaps any of them is a sad commentary on his mental state). Sounds like an epic failure on Mandia’s part. And Michael Mann? 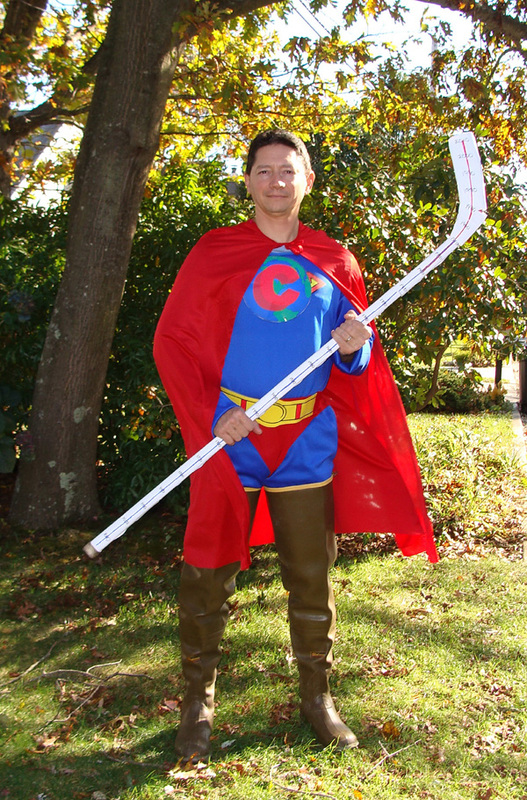 He’s no more made of steel than a wooden hockey stick. However, both sound like characters right out of some Marvel Comics book. It worked for PT Barnum and Buffalo Bill. That brings up a question of what real cowboys thought of the Buffalo Bill show at the time. Were they amused or disgusted? I guess it didn’t matter since both showmen were selling to a bemused but at the same time ignorant urban market. I thought the man of steal was Peter Gleick? Solid video. A lot of the regular readers could learn from it, despite it’s short length. Not a one of you has been through an experience like Dr. Mann has. Childishly belittling him just confirms what people already think about WUWT and its audience. The talking head in that video conveniently forgot to mention “hide the decline” and other such issues in climate reconstructions when he pronounced the present warming as unprecedented. in other words, the assumption is that while the past temperature reconstructions are all over the map and still controversial, the blade of the stick is still gospel. You should watch Alley’s talk. Might learn something. Here’s some irony for us. Carbon is added to steel to make it stronger. Always love it when the Super-Scott Mandia photo appears! He’ll never live that down, but one day, I hope he can laugh at the silly hubris that motivated him to dress up like that. Actually, if he doesn’t want criticism he needs to stop doing climate research. That has been made abundantly clear. Lol okay. Truthfully Anthony, you seem like too smart of a guy to be wrapped up in this nonsense. Ah, but wait, it appears the Mann of Steel has a flaw; an Achilles Heel. Lowly H20 and O2, over time will reduce him to a pile of brownish flakes, in a process known as corrosion. In the world of Climatism, that corrosive power stems from the atmosphere of lies and deceit they themselves have created. Why not? We live in a free world! So why is this man has no right to walk in what he wants? It is necessary to dress the way you want, and not as want a bunch of idiots around you .. We are free people, not slaves!!! 1) can you point out where in the video this is? 2) Is it really Michael Mann saying it?